People who love Peeps, and people who don't. My Dad and I? 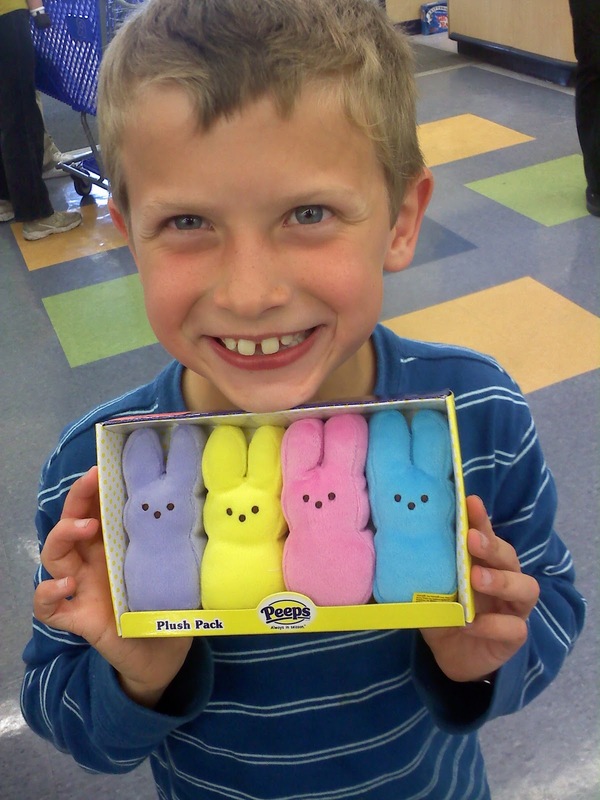 We LOVE Peeps. My Husband? He most decidedly does NOT. My kids? Well, I just don't know. I'm not a very good sharer, at least when it comes to Peeps, so they haven't really sampled them (probably better that way, being 100% sugar and all). My Dad and I love our Peeps the same way... unwrapped for a week until the sugar has become a stale crust and it makes a grinding sound on your teeth when you chew it up, and the marshmallow is more like saltwater taffy than fluffy marshmallow. Yum! I saw these little plush Peeps in the store last weekend, and texted this sweet pic to my Dad. On his cell phone, he thought they were just oversized Peeps and desperately wanted to know how he could get his hands on some! They had the little plush ducky Peeps too. Benjamin, who loves every fluffy small plush creature on planet Earth, wanted these so badly! Alas, at $6.99, they had to stay at the store. Besides, what good are Peeps if you can't eat them? What about you? Which side of the Peeps spectrum do you fall on? Don't worry, we can still be friends if you hate them. After all, I'm married to a guy who despises them! I do NOT like peeps! Nor does Clay. But our girls do. One time we were at the store and Emma shouted "I love those". I had never bought any of those, but she had one at school and liked it. I am definitely a peeps people. My wife and daughters are all occasionally peeps people, but I could eat a whole pack in one sitting, although I don't.... usually! BEN IS SO CUTE! I'm not a peeps person, I am a reformed peeps person. I use to adore peeps but now they just taste like a mess of yellow in my mouth. Follow My Wandering Life on Facebook!